The Morgan Library is Celebrating Puccini. The exhibition celebrates the 150th anniversary of Giacomo Puccini's birth. The exhibit includes original manuscripts, first-edition librettos, personal letters, a period poster and playbills, souvenir postcards, and rare material linked to Puccini's relationship with such legends as Enrico Caruso and Arturo Toscanini. 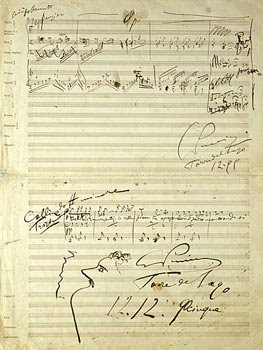 Puccini's operas are Le Villi, Manon Lescaut, La bohème, Tosca, Madama Butterfly, La fanciulla del West, La rondine, Il trittico (Il tabarro, Suor Angelica and Gianni Schicchi), and Turandot. (I've seen all but Le Villi and La fanciulla del West). The Morgan Library & Museum, which began as the private library of financier Pierpont Morgan, is located at 225 Madison Avenue (at 36th Street). The exhibit runs from September 15, 2009, through January 10, 2010. Admission is $12 for adults, Tuesday through Sunday. Admission is free on Fridays from 7 p.m. to 9 p.m..